We're down to the wire on the gay marriage issue here in Maine. If referendum question one passes, the 2009 legislation to legalize gay marriage will not take effect. As a socially liberal conservative, I find myself on the opposing side of a lot of my allies and I find myself confused and annoyed by some of the weird arguments gay marriage foes are making. Unexpectedly, the Bible has been left on the shelf for most of the campaign season. I like to tell myself that it's not conservatives who are opposing gay marriage, but Christians who happen to be conservatives, but I know that's not a realistic way to look at the situation. Both sides are willing to cite their religious views as inspiration. What drives me bonkers is that the anti gay-marriage campaign has stolen their strategy from the liberal playbook by moving the issue away from the adults the law is made for, and instead focusing on how it will effect children. We hear that legalizing gay marriage will give public school teachers permission to talk about the gay lifestyle in class (News flash - that was already happening in the 1990's when I attended a Maine public school) and that children will be brought up in gay marriage households (That's the gay adoption issue, and Maine already has it). Can there be anything more overtly disgusting that a supposedly conservative group cowering behind children for political gain? Their campaign logo is two parents holding hands with two children under the watch of a floating Maine - not a subtle reference to their "protect the children" arguments on what is clearly an issue about adults. In social circles, gay marriage already exists in Maine - it just hasn't been legally certified. I've talked to a few liberal pastors in Maine and all of them said they will perform gay weddings if asked. The only difference is Augusta currently doesn't admit these romances exist, and the legal rights and responsibilities that come with marriage are not automatically included. Stand for Marriage Maine has said that allowing gay marriage would infringe on religious freedom because gay couples would force unwilling churches to marry them. 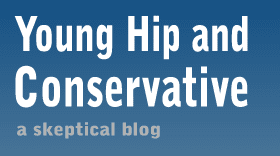 Can there be a more ignorant view on conservative principles? According to Larry Iannaccone, economics professor at George Mason University, America owes its high religiosity to the free market on religious faiths. He said because America didn't establish an official church, it allows the public to choose the church they like best. 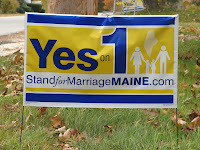 Unpopular churches dry up and go away, and that is exactly what Stand for Marriage Maine is concerned with. Gays will just go to the churches that welcome them. Some people, like the president, think "civil unions" are a good compromise. I do not. I think there is already too many obtuse, wordy pieces of legislation on the books that every citizen is expected to know and follow - from what renovations you are allowed to make at home to what you and an employee can agree on for a wage. Civil unions present further unnecessary complications and red tape for the sole purpose of preserving a mythical 1950's vision of what is and is not a marriage. Legalizing gay marriage in Maine is not about redefining marriage, or endorsing the gay lifestyle in our society. Legislature follows the trends of the our society - not the other way around. This issue is about weakening the state's power to define marriage and letting the individual - not society - determine how one wishes to live one's own life. This is one of the best arguments I have seen and extra points for it not being based on emotion. I am not sure how someone who is arguing against gay marriage would not be able to agree unless their arguments were based on religion. Well said: "This issue is about weakening the state's power to define marriage and letting the individual - not society - determine how one wishes to live one's own life." If there is a liberal dilemma, it would be supporting gay marriage while disagreeing with the rationale above. I feel like you have a great argument; however, my reality is how can one support gay marriages and still call themselves a "true christian" straight from the "Word of God"? I get a little confused on that issue. People say to let folks choose the way they want to live and to leave them alone, but if we accept this amendment one, then are we not saying that are hipocrites?